Clinically significant anxiety and depression are common in patients with cancer, and are associated with poor psychiatric and medical outcomes. Historical and recent research suggests a role for psilocybin to treat cancer-related anxiety and depression. 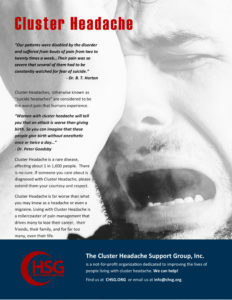 There are limited literature data on migraine-like accompanying features (MLF) in patients with cluster headache (CH). These symptoms are frequently reported by patients and may delay CH diagnosis. The aim of the present study was to investigate the occurrence of migraine-like symptoms in an Italian case series of CH patients and to determine whether these features influence the clinical phenotype of CH.